The ice surface was removed from Nassau Coliseum for the final time Tuesday, as the New York Islanders are set to head to Brooklyn’s Barclays Center for the 2015-16 season. 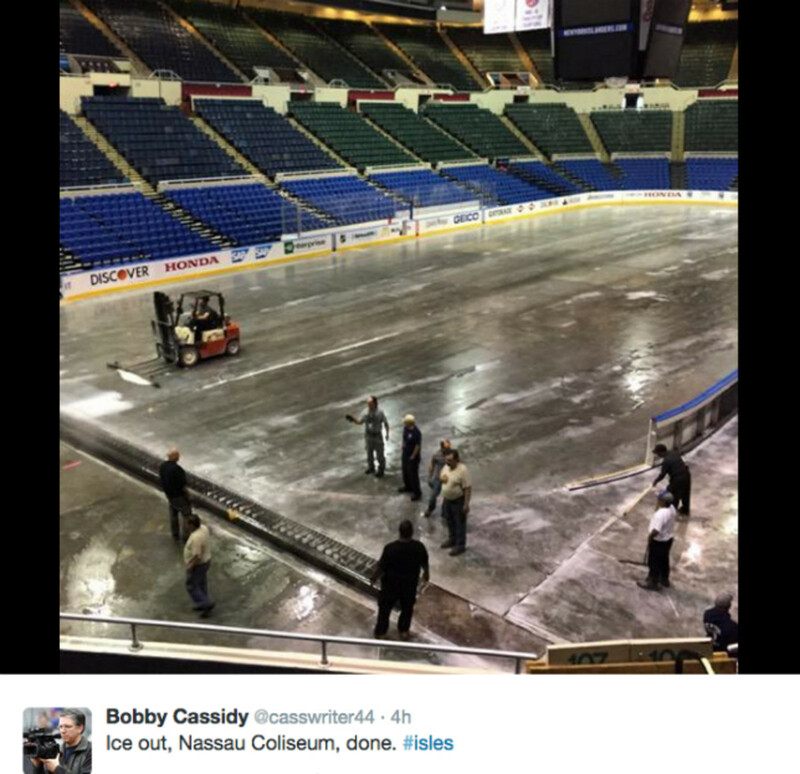 Check out photos from the teardown as hockey at Nassau Coliseum says goodbye forever. 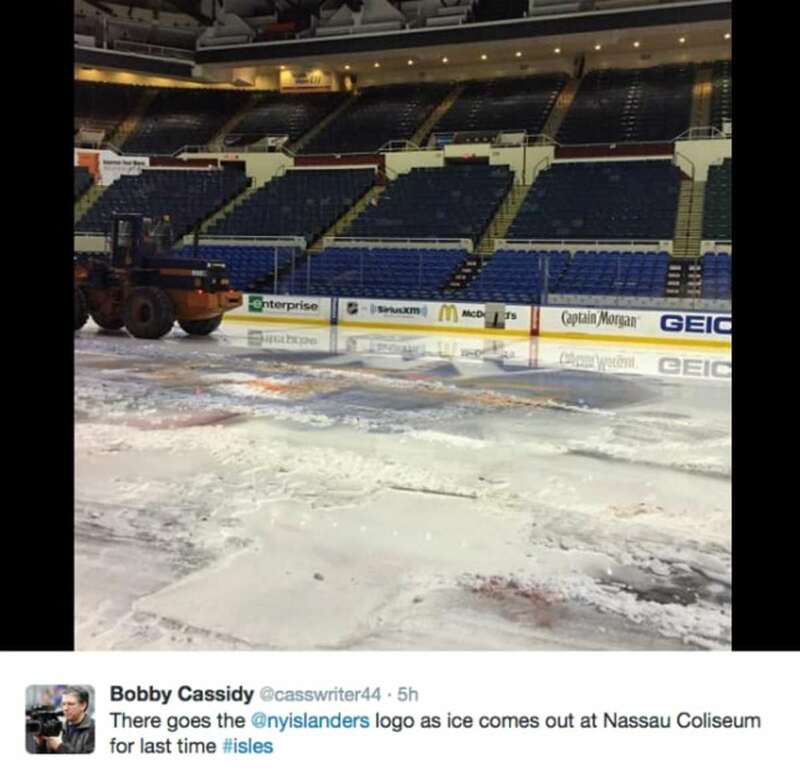 Bobby Cassidy caught some fantastic photographs of the rink’s last moments. The Islanders scored their first goal at Nassau Coliseum on Oct. 7, 1972, when Ed Westfall, one of the players New York selected in the expansion draft from the Boston Bruins, scored at 17:29 of the second period in the inaugural NHL game in the building. The Islanders went on to lose the game 3-2 to the Atlanta Flames, but would pick up their first win in the building five days later when they downed the visiting Los Angeles Kings 3-2. Fast forward more than 32 years later and history will show that the final goal scored at Nassau Coliseum, buried by New York’s Cal Clutterbuck, occurred at 19:07 of the third period in Game 6 of Islanders first-round series against the Washington Capitals. The final game at Nassau Coliseum will be remembered as a 3-1 post-season victory that helped force a Game 7. Next season, the Islanders will put down roots in Brooklyn at the Barclays Center. 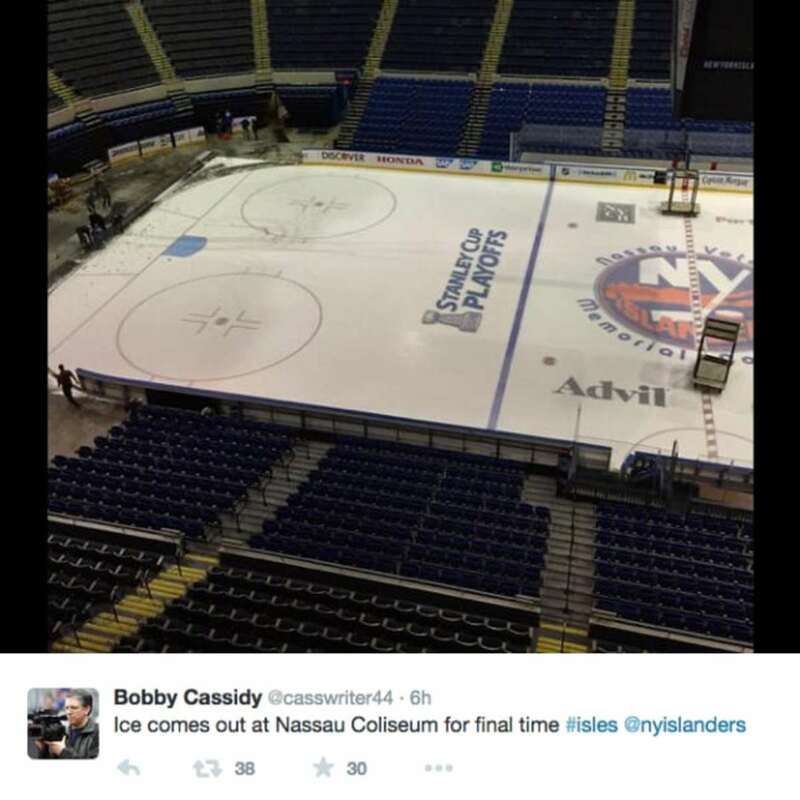 It will be the first season in Islanders history that is not played with Nassau Coliseum playing home to the team. And as sad as removing the ice surface is, it’s twice as gut-wrenching to think of what it will feel like when entering the building to no longer see the jersey numbers of Mike Bossy, Brian Trottier, Clark Gillies, Denis Potvin, Bobby Nystrom and Billy Smith. In addition to bringing out the surface and hauling away the retired sweater banners, the Stanley Cup championship banners, of which there are four from four consecutive years spanning from the 1979-80 season to 1982-83, will be taken down and moved to Brooklyn. Farewell to Nassau Coliseum.